This week’s King’s Talk was on ‘First Raise a Flag: How South Sudan Won the Longest War but Lost the Peace’ by Peter Martell. Peter has spent over a decade reporting from palaces and battlefields, meeting those who made a country like no other: warlords and spies, missionaries and mercenaries, guerrillas and gunrunners, freedom fighters and war crime fugitives, Hollywood stars and ex-slaves. Under his seasoned foreign correspondent’s gaze, he weaves with passion and colour the lively history of the world’s newest country. It was no surprise that he gave an eye opening and colourful account of the lively history of the world’s newest country, featuring revealing and vivid photo footage. He examined how Africa’s newest nation state plunged back into civil war so soon after its hopeful, excited birth. When South Sudan’s war began, the Beatles were playing their first hits and reaching the moon was an astronaut’s dream. Half a century later, with millions massacred in Africa’s longest war, the continent’s biggest country split in two. It was an extraordinary, unprecedented experiment. 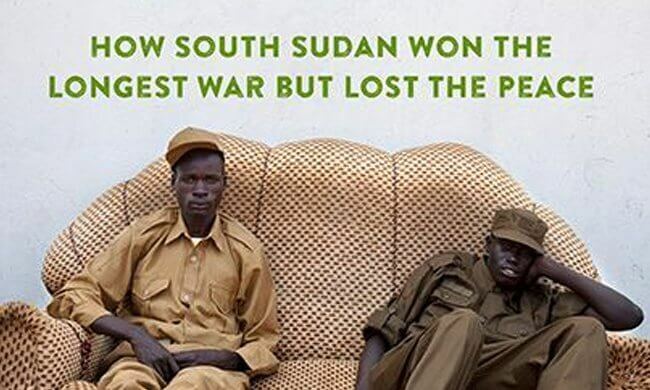 Many have fought, but South Sudan did the impossible, and won. However, it is also the story of a nightmare as South Sudan now represents one of the most dramatic failures in the history of international state-building. Three years after independence, South Sudan was lowest ranked in the list of failed states. War returned, worse than ever. Peter’s talk was a moving reflection on the meaning of nationalism, the power of hope and the endurance of the human spirit.